Whistleblower - What Does It Mean? What is a "whistleblower"? 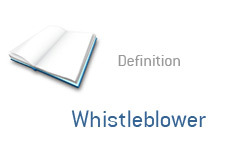 What is the definition of the term "whistleblower"? A whistleblower is a person who seeks to shed light on possibly illegal activity that is taking place at his/her company. A whistleblower is privy to certain knowledge that people on the outside of the company aren't aware of. Example: An employee of XYZ, Inc. is aware that the company is inflating their revenues using entirely illegal means. The company's executives hatched the scheme in order to keep the company's rapidly deflating business hidden from public view. These same executives have been unloading their shares in the company at the same time, clearly thinking that the scheme will eventually unravel and the company will fall. A "whistleblower" inside the company tips off a couple of different prominent news organizations as to what is going on, and how to best identify the illegal activity. The lid is soon blown off of the scheme and the top executives at the company are arrested. If this "whistleblower" hadn't revealed what was going on at the company, then an even greater amount of investor money may have been lost due to the scheme. "Whistleblowers" can people themselves in unenviable positions by disclosing what they know, which is why there are pieces of legislation in place to protect them from retribution.